It’s a wrap for Day 2 of SuiteWorld! The day was filled with motivational insights to inspirational success stories. Evan Goldberg’s incredible opening keynote started on the right note with a musical intro by the band Lucky Chops. Setting the energy levels, Goldberg took centre stage to talk about NetSuite’s personal growth journey. He went onto detail what it takes to succeed as a business now and into the future. Goldberg is passionate about the company’s connection to non-profits. The number of them utilising NetSuite has increased to 1300 in 2019. Migrating to the cloud has enabled non-profits to further their mission through their new ability to address the challenges and obstacles they face. Goldberg highlighted this NetSuite advantage with the CFO of The American Cancer Society, Rob King. With the move to NetSuite they now have developing financials and CRM. This in turn enabled a higher degree of visibility as a whole, which allows them to tell their story to a wider audience. The event saw success stories through various guest speakers. Vice’s Chief Accounting Officer Shawn Assad discussed how NetSuite is enabling them to not only grow, but to maintain control of their business. This success story was mirrored by Kelly Leonard from The Second City. He talked about how NetSuite has allowed their numbers to talk to each other which has meant he doesn’t need to be involved with the accounting. 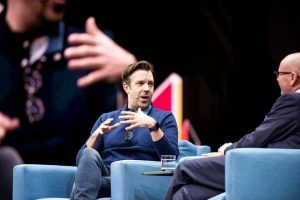 There was also some Hollywood in the air with the actor, writer and comedian Jason Sudeikis who was welcomed to the stage. He discussed the value of good work and leadership. NetSuite has grown globally with it’s customers and now operates in 21 new countries since 2016. 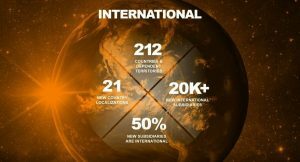 In total this means they now operate in 212 countries and dependent territories. With going global, comes the demand to maintain consistency across different locations. This consistency becomes a challenge when it comes to obstacles such as differences in tax laws and other regulations. Goldberg highlighted NetSuite’s commitment to continue research and development for their globalisation enablers. Some recent enablers developed were highlighted which included: Instalments, Multi-currency Expense, SuiteTax API and Global Trade Enablement. Oracle’s CEO Mark Hurd also took centre stage along with Goldberg. He discussed visibility, agility, tax and innovation. Since acquiring NetSuite in 2016, Hurd states that it was as strategic as investment we’ve ever made. They also discuss how more and more companies are now seeing the advantage of using cloud computing. Looking into the future they discuss the possibilities of artificial intelligence and how that would integrate into core applications. Some of our team are still in Las Vegas attending the rest of the events so if you would like to arrange a meeting to discuss your company’s NetSuite requirements, please get in touch.